From Skopje we turned west again towards the city of Tetovo. Tetovo lies at the foot of the mountains that mark the border with Kosovo, and it is also part of a majority ethnic Albanian region within Macedonia. We had particularly come to see a tiny museum in a village just north of the city. 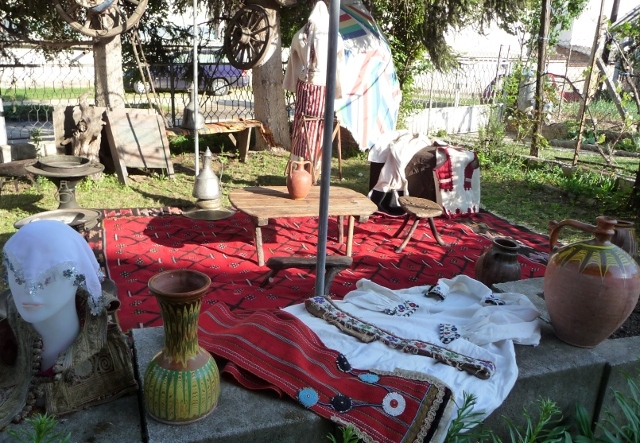 The Smallest Ethnological Museum in the World is at Džepčište, and is a collection created by Simeon Zlatev, known as Mone. 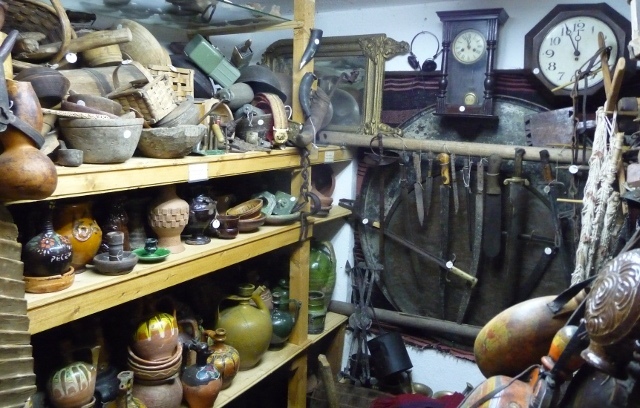 Mone has collected local traditional items for more than thirty years and houses them in a couple of rooms at the family’s home. At first we didn’t know we’d arrived in Džepčište, then we spotted the single sign ‘Museum’. Following it up a side road we were still none the wiser. Locals tend to know where any foreigners are going so we were shown the right way. We parked the van and went in through the garden gate of an ordinary house. We were warmly welcomed by Mone and his daughter Ivona. Ivona speaks excellent English and apologised that her father does not speak a word of the language (we apologised for not speaking many words of his language). We were invited to sit in the garden while tea and coffee were made, and then a whole exhibition was unpacked and laid out for us on the lawn – the overflow from rooms inside. When it was ready, we were invited to peruse the objects – beautifully handmade traditional costumes, small items of furniture, including a stool made from a single piece of wood – the stumps of the branches forming the legs, as well as jewellery, tools, pots and pans. Then we stepped, one-by-one, into the two rooms inside. They were crammed with objects – memorabilia, old photos, cameras, ornaments of every sort, lots of ancient radiograms, beautiful chests, all carefully catalogued and arranged. 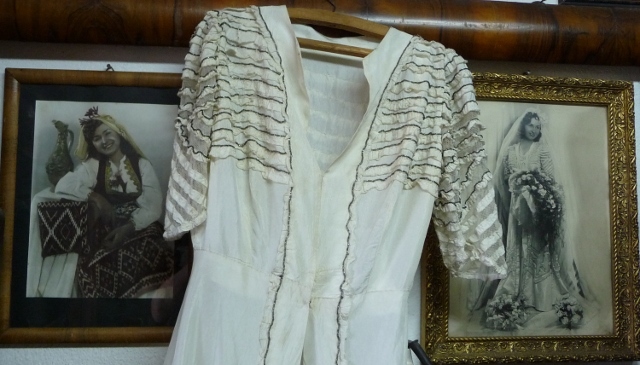 Most poignant was the photo of Mone’s mother on her wedding day, with the dress she was wearing hung up beside it. His mother is now over 90 years old and Ivona resembles her strongly. We must have spent at least a couple of hours talking to Ivona and Mone, learning about the collection, their lives and talking of Ivona’s offer of work in the States. It is a terrific opportunity for her, but as the only child, it’s a terrible wrench for her parents. There are few opportunities for young people in Macedonia though. Before we left, we asked them if they knew of anywhere we could camp. 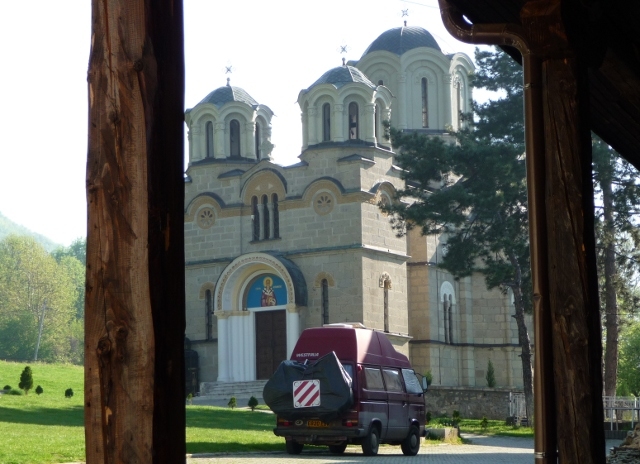 Mone, through Ivona, suggested a monastery about 10km away, where he was sure they would let us park overnight. To make sure of this and to show us the way, he and Ivona jumped in their car, and lead us there. The Lešok monastery complex also has an outdoor restaurant and the tail end of a wedding party in the grounds made for a lively atmosphere. Mone went to talk to the priest in charge, returning a few minutes later to say that all was well and they were happy for us to camp there. The church of Atanasias at the monastery was destroyed in 2001 during the inter-ethnic conflict that flared up in the area. The Zlatev family is part of the Macedonian minority, and Ivona clearly remembers waking to the sound of gunfire and bombs. The family moved to Skopje for a time, but fortunately the museum and the village survived intact. With EU aid, the church has now been rebuilt and is seen as a symbol of reconcilation. We went to admire it and meet and thank the priest who had given permission for us to stay there. We had dinner at the restaurant and made our van at home and passed a peaceful night. We had promised to stop into the museum the next day and wanted to say thank you. Mone’s wife, Mirjana was there and made us tea of wild herbs collected in the mountains, and insisted on providing us with supplies of the herbs so we can make our own on the road. We were touched by the family’s kindness and generosity and will remember our visit to Džepčište fondly. We had two sights to see in Tetovo itself, the first we found easily – a wonderful painted mosque in the centre of the town. We wandered into the garden around it to have a closer look. We didn’t expect to be allowed inside, but the guardian beckoned to us and removing our shoes, we entered. It was magical. 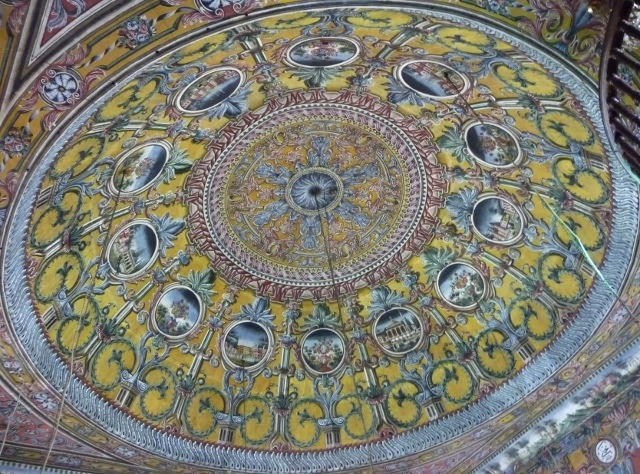 The floors were richly carpeted, chandeliers hung from the ceiling and every surface was painted with flower motifs, including the domed ceiling. It is one of the most beautiful places we have seen. Our last stop in Tetovo, when we eventually found it, was the Bektashi tekke – Baba Arabati. The Bektashi order is a form of Islam, founded in the 13th century, related to Sufism, which emphasises the mystical. After the fall of communism, it has seen a revival among Albanians. 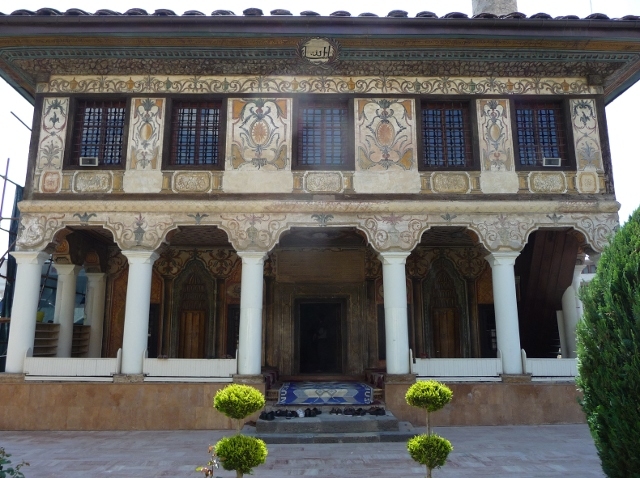 This tekke, akin to a monastery, was founded in the 16th century and is set in a garden compound with different religious buildings mainly dating from the 18th century. 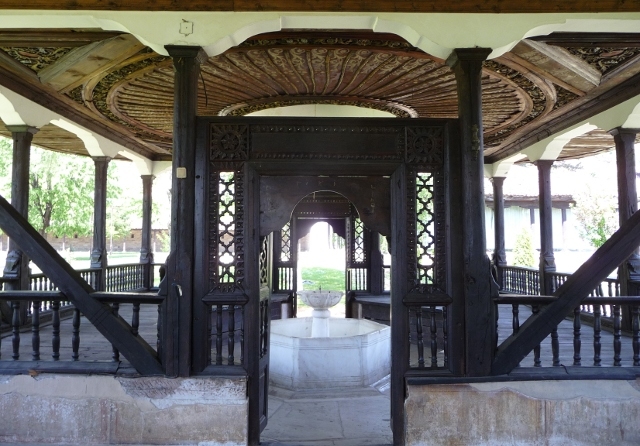 However, the tekke at Tetovo has also had a troubled recent history. Its most recent conflict being with Sunni Muslim militant groups who occupied and damaged buildings in 2002. We wandered through the gates and the security guard showed us round. It was hard to imagine any sort of conflict in such a tranquil place. Tetovo is still seen by outsiders as a trouble spot and people from other parts of Macedonia don’t tend to go there if they can help it. After, when we mentioned to Macedonians that we’d come from Tetovo, they wondered why on earth we had gone there. We told them – to visit the smallest museum run by people with the biggest hearts. Excellent T shirt Ivona is wearing, still loving the travelogue brightens my day to find a new post from friends so far afield.